Shoukry was referring to the international coverage of the issue of security personnel raiding the journalists’ syndicate building to arrest two journalists, Amr Badr and Mahmoud al-Sakka, during a sit-in they had been staging on 1 May 2016. “Authorities should open an investigation into the increasing assaults on journalists instead of supporting efforts to intimidate and silence the press,” Sherif Mansour, MENA Program Coordinator at the Committee to Protect Journalists (CPJ), previously told Aswat Masriya. 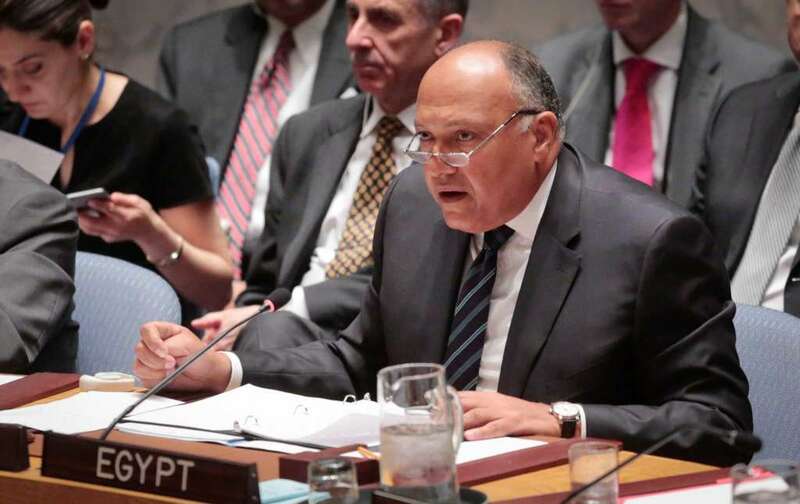 Shoukry, on the other hand, stated that international coverage of the event did not match up to the conditions in Egypt, adding that there are many media outlets that enjoy freedom of expression. He added that this would be a “crime” in any country in the world. “Anyone in jail in Egypt is there based on the decisions of an independent judiciary,” Shoukry said during the press conference on Wednesday. According to lawyer Sameh Samir, who was present in defence of Badr and Sakka, both journalists denied accusations leveled against them, which included inciting protests, attempting to overthrow the regime and broadcasting false news with the aim of disturbing public peace. Following the storming of the syndicate and the arrest of both journalists, the press syndicate demanded the sacking of the Interior Minister Magdy Abdel Ghaffar and called for an emergency general assembly meeting to discuss the incident. The interior ministry, however, denied storming the syndicate’s building or using force to arrest the two journalists. A ministry statement issued one day later said that the journalists handed themselves in and that all the arrest procedures took place within the framework of the law. This content is originally from Aswat Masriya.